When it comes to repairing storm damages to your property, there are important factors to consider. Many of our clients have carefully considered who they should choose as their insurance contractor in Lexington, KY.
Want quality repair services? See if you believe we are one of the best choices as your roofing contractor. Need to file for damages? View our insurance contracting process. For info on our services contact us today. We provide our services with a detailed unbiased recommendation before we even begin to provide an estimate. At Lexington Blue, our focus is to ensure you have all the right information, so you can feel confident that you are selecting the right contractor for your insurance repairs. I’ve dealt with quite a few contractors and have had my share of insurance claims over my lifetime. After using Lexington Blue to get my roof and gutters done through my insurance company, I’m positive that they are in a league of their own. My insurance company paid for a whole new roof! The staff at this company is amazing. Great establishment. Contractors work with their clients using numerous venues. 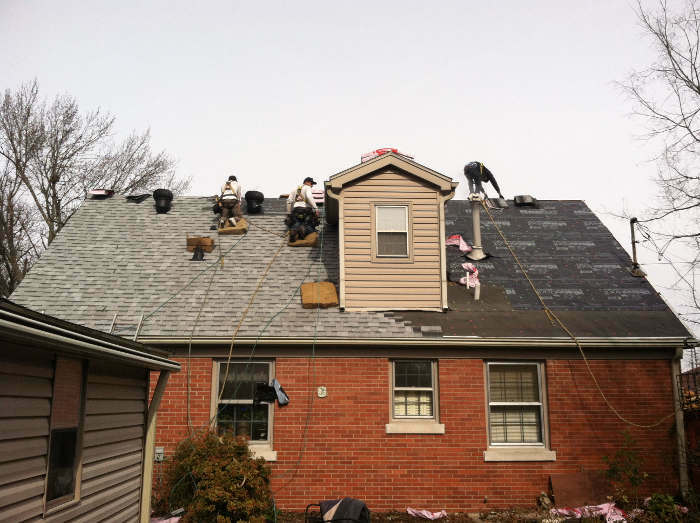 In the case of insurance restoration, such as roof repair for hail storm damage, the contractor will most likely be working from an insurance scope. This is provided by the insurance adjuster that inspected and verified the damage to the property. The scope will dictate exactly what work is performed to return the homeowner’s property to the condition it was in prior to the damage. In cases of home improvement, most contractors will give an estimate the homeowner can expect to pay. As the project progresses, the homeowner may decide to change some of the design, colors, sizes and may even add new renovation plans to the original project. This will change not only the length of time the project takes, but also the final cost. In other words, this type of contract work is much more flexible and fluid. In areas where storm damage in Lexington has occurred it’s not unusual for unscrupulous “storm chasers” to appear looking for work. These individuals travel from state to state literally chasing storms so that they can sell their services. They will establish a local phone number and some will even rent a local office if there is a lot of work in the area. These so called storm chasing contractors will market themselves as a local business when in fact they are not. The problem with this is that the homeowner has no recourse if the roof or other storm repair work is done poorly. They offer no valid warranty and unfortunately will not even be around a year from now. These outfits typically move in quickly and take advantage of panicked homeowners. If you have suffered storm damage, take your time if you can and do your due diligence by checking out a company with the BBB. Also, make an effort to reference the company’s website and read the reviews. Ask for your own references from other local Lexington residents to confirm their reviews. A legitimate company will gladly provide this to you. Choosing a reputable local insurance contractor with an excellent BBB rating is a wise choice. Chances are, they will still be right here in Kentucky for years to come. As a local contractor, we believe that doing the work perfectly in the first place eliminates the possibility of problems down the road. We want our clients to be pleased with quality of our work and rave about us positively to their friends and neighbors! The best advertisement in our opinion is word of mouth, so we treat each client as family and strive for perfection every time. Lexington Blue is different. We are not your typical contracting service. Our clients and their needs come first. If we say we will be there at a certain time, we will. If you leave a voice mail, email or text we respond efficiently. We treat each client as if they are our only client. Read our reviews on BBB and check our what our recent clients have said about us. You will find that you are dealing with personable perfectionists and we are proud of that! Overall very pleased with the job Brad with Lexington Blue did. Brad is very knowledgeable and informative. In a very short time I had a new roof on my house. His crew was very professional and got the job done quickly. The best part of the experience, Brad managed most of the interaction with the insurance company so that it made that much easier on myself.